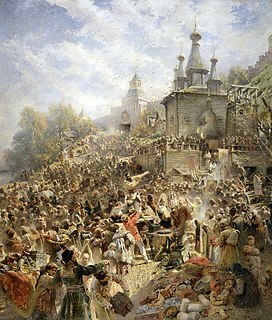 The Russian famine of 1601–1603 was Russia's worst famine in terms of proportional effect on the population, killing perhaps two million people, a third of the Russian people. The famine compounded the Time of Troubles, when the country was unsettled politically and later invaded by the Polish-Lithuanian Commonwealth. The many deaths contributed to social disruption and helped bring about the downfall of Boris Godunov, who had been elected tsar during the interregnum. The famine was part of worldwide record cold winters and crop disruption, which geologists in 2008 linked to the 1600 volcanic eruption of Huaynaputina in Peru. A 2008 study by Kenneth L. Verosub and Jake Lippman documents worldwide famine after the eruption of a volcano in Peru in 1600. Huaynaputina ejected 16 million to 32 million metric tons of particulates into the atmosphere, notably sulfur dioxide, forming sulfuric acid and creating a volcanic winter; this reduced the amount of sunlight reaching the Earth's surface (see Albedo), which scientists believe contributed to bitterly cold winters, loss of crops and animals, and massive famine around the world. As a result, people killed many animals with their bare hands to preserve their furs for warmth. The famine was documented across the world: "Records from Switzerland, Latvia and Estonia record exceptionally cold winters in 1600–1602; in France, the 1601 wine harvest was late, and wine production collapsed in Germany and Colonial Peru. In China, peach trees bloomed late, and Lake Suwa in Japan had one of its earliest freezing dates in 500 years." During this two-and-a-half-year period, 127,000 bodies were buried in mass graves in Moscow alone. Widespread starvation killed perhaps two million in Russia, a third of the population. The suffering and social disruption were part of the political unrest called the Time of Troubles, which led to the downfall of Tsar Boris Godunov. Having previously acted as regent for Tsar Feodor, Godunov had been elected to succeed him during an interregnum. ^ Perkins, S. (2009). "Disaster goes global: The eruption in 1600 of a seemingly quiet volcano in peru changed global climate and triggered famine as far away as Russia". Science News. 174 (5): 16. doi:10.1002/scin.2008.5591740519. ^ Verosub, K. L.; Lippman, J. (2008). "Global Impacts of the 1600 Eruption of Peru's Huaynaputina Volcano". Eos, Transactions American Geophysical Union. 89 (15): 141. doi:10.1029/2008EO150001. 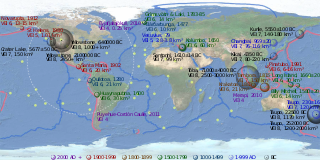 ^ a b c "1600 Eruption Caused Global Disruption", Geology Times, 25 Apr 2008, accessed 13 Nov 2010. ^ Andrea Thompson, "Volcano in 1600 caused global disruption", MSNBC.com, 5 May 2008, accessed 13 Nov 2010. ^ "The 1600 eruption of Huaynaputina in Peru caused global disruption" Archived 28 April 2010 at the Wayback Machine, Science Centric. The year 1816 is known as the Year Without a Summer because of severe climate abnormalities that caused average global temperatures to decrease by 0.4–0.7 °C (0.7–1.3 °F). This resulted in major food shortages across the Northern Hemisphere. Laki or Lakagígar is a volcanic fissure in the south of Iceland, not far from the volcanic fissure of Eldgjá and the small village of Kirkjubæjarklaustur. The fissure is properly referred to as Lakagígar, while Laki is a mountain that the fissure bisects. Lakagígar is part of a volcanic system centered on the volcano Grímsvötn and including the volcano Thordarhyrna. It lies between the glaciers of Mýrdalsjökull and Vatnajökull, in an area of fissures that run in a southwest to northeast direction. Huaynaputina is a stratovolcano in a volcanic upland in southern Peru. Part of the Central Volcanic Zone of the Andean Volcanic Belt, it is the product of the subduction of the oceanic Nazca tectonic plate beneath the continental part of the South American tectonic plate at a rate of 10.3 centimetres per year (4.1 in/year). Huaynaputina is a large volcanic crater, lacking an identifiable mountain profile, with an outer stratovolcano and three younger volcanic vents. The vents of Huaynaputina form a north-northwest–south-southeast trend. El Chichón, known as Chichonal, is an active volcano in Francisco León, north-western Chiapas, Mexico. El Chichón is part of a geologic zone known as the Chiapanecan Volcanic Arc. El Chichón is a complex of domes with a tuff ring, made of ejected volcanic material, located between the Trans-Mexican Volcanic Belt and the Central America Volcanic Arc. El Chichón erupted in 1982; prior to this, activity had not occurred since ca.1360, although debates in literature occur around an eruption occurring in ca.1850. Ampato is a dormant 6,288-metre (20,630 ft) stratovolcano in the Andes of southern Peru. It lies about 70–75 kilometres (43–47 mi) northwest of Arequipa and is part of a north-south chain that includes the volcanoes Hualca Hualca and Sabancaya, the last of which has been active in historical time. The Silverthrone Caldera is a potentially active caldera complex in southwestern British Columbia, Canada, located over 350 kilometres (220 mi) northwest of the city of Vancouver and about 50 kilometres (31 mi) west of Mount Waddington in the Pacific Ranges of the Coast Mountains. The caldera is one of the largest of the few calderas in western Canada, measuring about 30 kilometres (19 mi) long (north-south) and 20 kilometres (12 mi) wide (east-west). Mount Silverthrone, an eroded lava dome on the caldera's northern flank that is 2,864 metres (9,396 ft) high may be the highest volcano in Canada. This timeline of volcanism on Earth is a list of major volcanic eruptions of approximately at least magnitude 6 on the Volcanic Explosivity Index (VEI) or equivalent sulfur dioxide emission around the Quaternary period. Casiri is a mountainous complex in the Barroso mountain range in the Andes of Peru, about 5,650 metres (18,537 ft) high. It is located at the border of the Tacna Region, Tacna Province, Palca District and the Tarata Province, Tarata District. The Samalas volcano erupted in 1257 CE, in a major eruption which left behind a large caldera that contains Lake Segara Anak. The eruption had a probable Volcanic Explosivity Index of 7, making it one of the largest eruptions of the current Holocene epoch. Samalas volcano lies next to Mount Rinjani on Lombok Island in Indonesia. Sabancaya is an active 5,976-metre-high (19,606 ft) stratovolcano in the Andes of southern Peru, about 70 kilometres (43 mi) northwest of Arequipa. It is considered part of the Central Volcanic Zone of the Andes, one of the three distinct volcanic belts of the Andes. The Central Volcanic Zone includes a number of volcanoes, some of which like Huaynaputina have had large eruptions and others such as Sabancaya and Ubinas have been active in historical time. Sabancaya forms a volcanic complex together with Hualca Hualca to the north and Ampato to the south and has erupted andesite and dacite. It is covered by a small ice cap which leads to a risk of lahars during eruptions. Tutupaca is a volcano in the region of Tacna in Peru. It is part of the Peruvian segment of the Central Volcanic Zone, one of several volcanic belts in the Andes. Tutupaca consists of three overlapping volcanoes formed by lava flows and lava domes made out of andesite and dacite, which grew on top of older volcanic rocks. The highest of these is usually reported to be 5,815 metres (19,078 ft) high and was glaciated in the past. Ticsani is a volcano in Peru. It consists of two volcanoes that form a complex: "old Ticsani", which is a compound volcano that underwent a large collapse in the past and shed 15–30 cubic kilometres (3.6–7.2 cu mi) of mass down the Rio Tambo valley; the other is a complex of three lava domes which were emplaced during the Holocene. The last eruption occurred after the 1600 eruption of neighbouring Huaynaputina. Ubinas is a stratovolcano in the Moquegua Region of southern Peru, 60 kilometres (37 mi) east of the city of Arequipa. Part of the Central Volcanic Zone of the Andes, it is 5,672 metres (18,609 ft) above sea level. The volcano's summit is cut by a 1.4-kilometre (0.87 mi) wide and 150-metre (490 ft) deep caldera, which itself contains a smaller crater. Below the summit, Ubinas has the shape of an upwards-steepening cone with a prominent notch on the southern side. The gently sloping lower part of the volcano is also known as Ubinas I and the steeper upper part as Ubinas II; they represent different stages in the geologic history of Ubinas.